In the testing for the double twill I found that the selvedge was a bit tight, making the dreaded "smile" curve across the web. I was using an 8-end satin on 12 ends on each side of the web. I tweaked the file to make the selvedge a 12-end satin, a looser interlacement, and tried it out. It seems to be working better, and the fell is level. For those who care about such things, here's a picture of the new selvedge. Double twill is a structure I wove a lot of nine or ten years ago. It involved two warps, light & dark, and (at that time) 4 wefts, usually red, blue, yellow & green. There are many color possibilities with that arrangement; The twill in the top layer can have either a light or a dark warp, and any one, two, or three of the colored wefts; in addition, the twill on top can be 1/3, 2/2, or 3/1. Multiplying all that out, you get 84 color possibilities. For more information about this interesting structure, refer to Chapter 8 of The Woven Pixel (see sidebar). I'm returning to the double twill structure for an upcoming project, but I've decided to work with the 3-weft version instead. There will be black & white warps, and the three wefts can be used one or two at a time, with the three different twills and either a dark or a light warp on top. This multiplies out to 36 color possibilities, still a gracious plenty. My loom is currently set up to weave at 60 epi, and it has a black warp on it, so I can't do a true color sample until I rewarp it with black and white. But I can still get a lot of information from a sample. What I specifically want to know is what weft weight will work best with the 20/2 cotton warp set at 60 epi. I wove a small sample this morning, first with 20/2 cotton as the weft, and next with 10/2 cotton. I learned a lot. The 20/2 cotton weaves to 96 ppi in this structure, while the 10/2 cotton weaves to 72 ppi. I'm liking the 10/2 version much better, and after I rewarp the loom in black & white, I'll do a real weave blanket to see all 36 colors. Meanwhile, here's a digital simulation of the weave blanket. It looks better if you click on it to enlarge. I've added a new category, Double Twill, to my list. I'll be using Weaverly to document the progress of this project (my virtual notebook, if you like), so if you want to follow along, Double Twill is the ticket. With a nod to Ian & Sylvia, The Irish Rovers, et al . . .
A nod to a great textile product: sail! Yesterday we went sailing on the Eastern Star, out of Lunenburg. Here's a view skyward. I love hearing the words "prepare to come about." I wish there were a way to say that in everyday conversation. Have to ponder that. Another textile experience -- the furled sail on the bowsprit of the vessel Bluenose II, docked in Lunenburg Harbor. At the Lunenburg waterfront--music by the Bridgewater Fire Department band and combined choirs of area churches. He lighteth me across the dark waters; He steereth me in the deep channels. He keepeth my log. He guideth me by the star of His holiness for His name's sake. Yea, though I sail 'mid the thunders and tempests of life, I shall dread no danger, for Thou art with me; Thy love and Thy care they shelter me. Thou preparest a harbour for me in the homeland of eternity. Thou anointest the waves with oil. My ship rideth calmly. Surely sunlight and starlight shall favour me on the voyage I take. A mostly sunny day, mid-morning, near Rose Bay, NS. We have been prowling the South Coast, finding treasures everywhere we look. Another gorgeous Cotswold fleece from Ross Farm. This one had several shades of gray on one animal, curly & lustrous. This snapshot of a beautiful Cotswold fleece was captured from a slow moving sheep at the Ross Farm Museum. 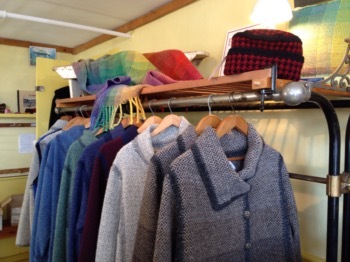 Had a lovely chat this afternoon with Marrie Berkelaar at Double Whale Handwoven Designs, about her garments all woven with Nova Scotia wool. Her crocheted edges & seams are perfection.